Why is Dunder Mifflin Called Dunder Mifflin? 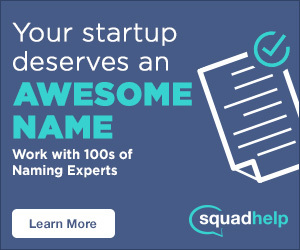 99% of the time we write on how tech brands got their names, but once in a blue moon, we like to be a little adventurous and explore a new space. After binge watching The Office on Netflix the other evening (don’t judge, I know you’re guilty of it too), I thought it would be entertaining to learn what inspired the name, Dunder Mifflin. In all honestly, I had a pretty good guess, but I thought it was a good excuse to watch the top 10 Dwight Schrute moments on Youtube. Like some of the greatest: Anchorman, Wedding Crashers and Bridesmaids, the one-liners never get old!For the handful of people that don’t know, The Office is a mockumentary that follows the hysterical out-of-touch Michael Scott, played by Steve Carrel, around his office at a mid-level paper supply company in Scranton, Pennsylvania. The show was written by Greg Daniels and produced by Howard Klein, Ricky Gervais (the star of the British version of The Office), Stephen Merchant and Ben Silverman. The show aired on NBC from 2005-2013 and depicts the mundane lives of employees that work for this fictional paper company called Dunder Mifflin. According to their website, Dunder Mifflin “provides its customers quality office and information technology products, furniture, printing values and the expertise required for making informed buying choices. We provide our products and services with a dedication to the highest degree of integrity and quality of customer satisfaction, developing long-term professional relationships with employees that develop pride, creating a stable working environment and company spirit.” With offices in Buffalo, Albany, Utica, Akron, Camden, Nashua, Yonkers, the show focuses on their Scranton branch, which is a surprisingly successful branch, considering the small amount of time they actually spend selling paper. Why is it called Dunder Mifflin? The brand name Dunder Mifflin is derived from the two founders’ last names, as revealed in Season 4, episode 2. In the episode titled Dunder Mifflin Infinity, Ryan Howard (aka “The Temp”) returns to the Scranton branch to discuss his strategy for selling paper online via their first and newly launched website, a project he’d been leading from Dunder Mifflin’s corporate office in New York. Due to their disagreements in the past and annoyance with Ryan’s ambitious attitude and ego, Michael Scott resists the need to change and invites 87 year old, co-founder Robert Dunder to address the team in the conference room. Mr. Dunder goes on to explain that the company started in 1949 as an industrial supplier, mainly of metal brackets to construction businesses. At some point, they pivoted the organization and became a paper supplier, but not before boring everyone in the conference room. Before Michael kicks Mr. Dunder out, claiming he is delirious, Robert Dunder explains that he met co-founder Robert Mifflin at the Rotary Club before starting the company together. Ryan Howard, BJ Novak’s character, was named after MLB All-star Ryan Howard of the Phillies because he used to play for a minor league team in Scranton called the Wilkes-Barre RailRiders). A less well known fact, several of the characters play their real first names. For example, Phyllis Smith plays Phyllis Lapin-Vance, Angela Kinsey plays Angela Martin, Oscar Nunez plays Oscar Martinez, and Creed Bratton plays Creed Bratton! And even though the office really captures the essence of Scranton, the show was not filmed in Pennsylvania, but was shot in Panorama City, CA on 13927 Saticoy Street. After the final episode of The Office, NBC struck a deal with Quill, a subsidiary of Staples, to sell Dunder Mifflin paper online. Not long ago, we witnessed this clever marketing stunt, known has reverse product placement, in HBO’s hit show, Silicon Valley. Other fictional brands that have entered the real world include Duff Beer (Simpsons), The Bubba Gump Shrimp Co. (Forrest Gump) and Wonka Candy (Willy Wonka and The Chocolate Factory). “Paper…is a race to the bottom as paper usage is going down,” says Paul Bessinger, the director of innovation at Quill.com. “We’re looking for different pop culture phenomena and external brands that we can tie to these mundane product categories to differentiate. That’s really how initially pairing copy paper and Dunder Mifflin came about.” A few years ago, and maybe still today, It became one of the company’s most successful brands, generating millions of dollars in revenue annually. NBC keeps ~6% of all sales. 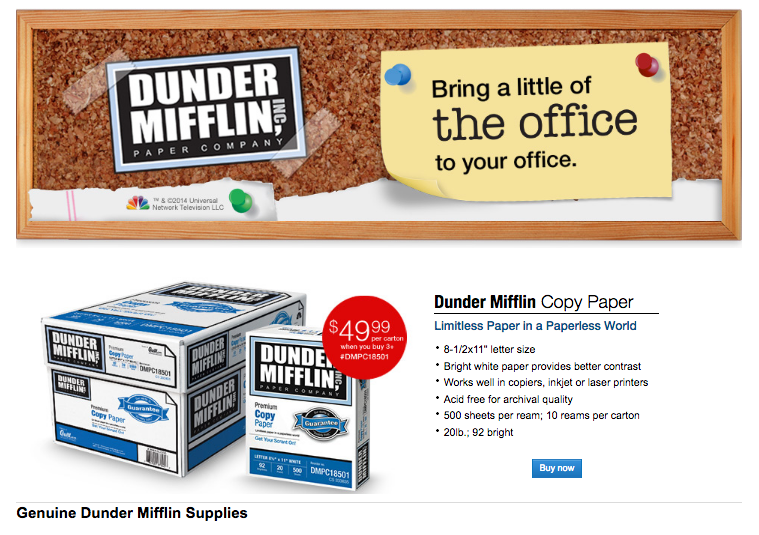 You can buy your very own Dunder Mifflin paper here.